NWF Plumbing PLUS LLC - Name Brand Plumbing Fixtures DIY Faucet Repair WE ACCEPT ALL MAJOR CREDIT AND DEBIT CARDS! ﻿For most homes, the kitchen is more than just a space to prepare food. It is the heart of the home, a place where everyone can gather together and enjoy being a family. It's also one of the most common renovations in a new home, and one of the most dramatic. From floors to countertops to ceilings and beyond, designing a great gathering space from scratch can be challenging. These tips will help you get the most out of the space you have while staying under budget and creating a great result. We replaced this customers cast iron tub with this WHITE tub from LOWES. We also replaced the floor tile with tile the customer picked out from LOWES. We also replaced the white tile surround with tile the customer picked out from LOWES. The same with the new DELTA oil rubbed bronze tub/shower valve. 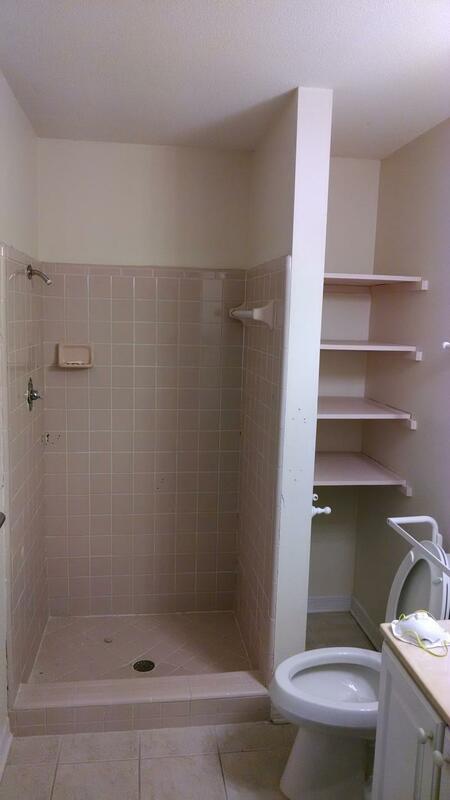 We started with this dated PINK tile shower and closet. 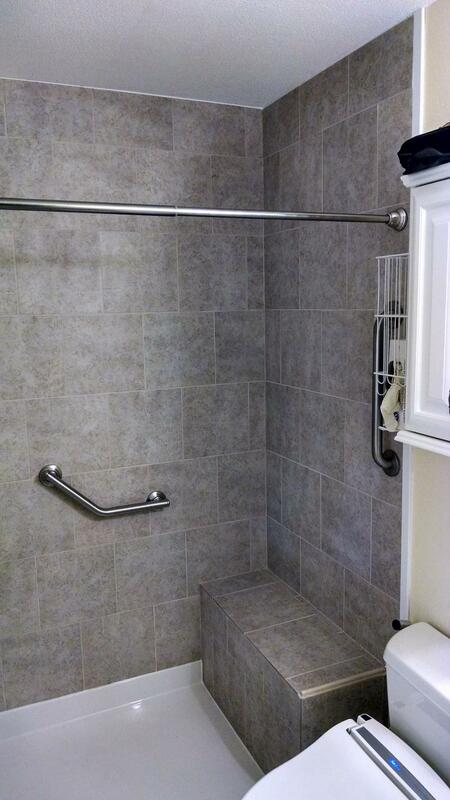 We installed a Barrier Free fiberglass shower pan with a tile surround to the ceiling. The Barrier Free pan was needed for the 92 year old homeowner. We also removed the floor tile and restored the orignial Terazzo flooring. Conserving water not only lowers your water and power bill, but it will also protect the environment. Reducing your overall water consumption can reduce the strain on our utilities, dams and reservoirs, meaning that we won’t have to build new ones as quickly. This is particularly important since a recent government study discovered that 36 states in the U.S. will experience local, regional and even statewide water shortages by 2013. Our supply of abundant water has been tapped in the United States, largely because our population continues to grow while the supply of water on earth is finite. Building more dams and reservoirs won’t solve the problem, but conservation can have a tremendous impact on our natural resources. We removed an outdated fiberglass tub/shower unit, replaced the tub/shower valve with a Delta chrome single handle fixture. The 30" X 60" tub is Biscuit and White swirl and also has a large shampoo holder and cultured marble panels to the ceiling. 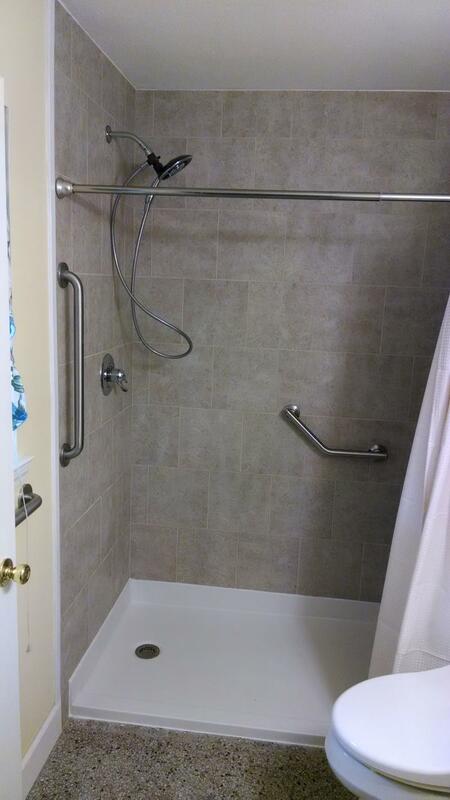 We removed a WHITE fiberglass tub and shower one piece unit, relocated the drain, replaced the tub/shower valve with a DELTA universal valve with CHROME trim, added the slide bar and hand held shower head, and (3) 18" handicap grab bars.